Last November 8, typhoon Yolanda (international code name: Haiyan) slammed into the central Visayas with record-breaking force. According to the National Disaster Risk Reduction and Management Council, typhoon Yolanda killed at least 3,976 people, injured another 18,175, and destroyed the homes and livelihoods of more than half a million Filipinos. Volunteers help transport packed relief goods to waiting aircraft. In response, Victory worked to reestablish communications with the affected areas and identified key areas for immediate relief, including Tacloban, Leyte; Roxas, Capiz; and Coron, Palawan. On November 9, the day after the typhoon hit, Victory centers in Metro Manila opened their doors to receive relief goods and other donations for distribution to families and communities affected by typhoon Yolanda. As of November 15, donors have given more than 19 tons of assorted food items, toiletries, clothes, and drinking water. The first batch of relief goods, amounting to ten tons, has been successfully transported via C130 plane to Tacloban, Leyte, where they were sent directly to our Victory church in Tacloban City. Pastor Eugene Ramirez, senior pastor of Victory Tacloban, is currently leading the relief efforts for the church members and their surrounding community. Six more tons of relief goods have already been delivered to Operation Blessing, and will be sent to Guiuan, Northern Samar, different parts of Leyte, as well as Iloilo, Bohol, and Roxas. Three more tons are being readied for deployment by Operation Blessing, which has people on the ground in areas where we do not have a Victory church. Victory Metro Manila centers will continue to receive relief goods until Sunday, November 17; these donations will be forwarded to Operation Blessing. Monetary donations can also be given online at http://victory.org.ph/give. Victory is currently strategizing on transitioning from just providing initial relief to jumpstarting the rehabilitation and rebuilding of homes of affected families and church communities in the typhoon-ravaged areas. Please continue praying for the Visayas region as relief efforts remain ongoing. Pray that peace and order may reign in Tacloban and all other affected areas. Also, please for the safety, strength, and sustaining grace for all relief workers, and for our local and national government officials to have wisdom to effectively lead in righteousness and compassion as they serve the needs of those affected by the typhoon. Thank you for your compassion and participation. Your generosity is helping provide comfort and restore hope amidst this unprecedented time of calamity. Volunteers from Victory Fort Bonifacio pack relief goods at the Every Nation Building. 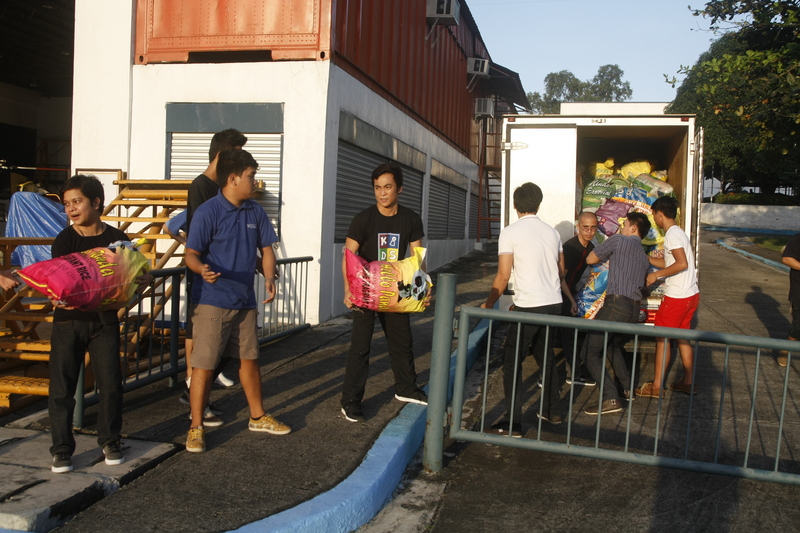 Whole families pitch in to pack relief goods at the Every Nation Building in Fort Bonifacio. Upon arrival in Tacloban, donations were immediately sorted out by volunteers, relief organizations, and government workers for swift deployment to affected neighborhoods. Donations were marked by military personnel for swift delivery to neighborhoods that needed it the most. Relief goods, including much-needed bottles of water, are unloaded from a truck in Tacloban City.